I am addicted to buying tops. 3/4 of all my clothes are mostly just tops... that's just how much I love them. Well now I'm doing some online shopping and I'd like to share some tops I found that I thought were must haves, but most importantly these tops are sweaters! It's sweater weather. This sweater caught my attention. Although it is plain, I love the color. It is a very nice shade. The color is suitable for the fall and it sets the mood of staying warm in the fall. Most importantly it is not one of those tight sweaters... It is a bit oversized. It will be great to wear with just plain black leggings! This is a must have in my closet. This sweater is from Brandy Melville. This sweaters also very plain, but I love plain simple sweaters. 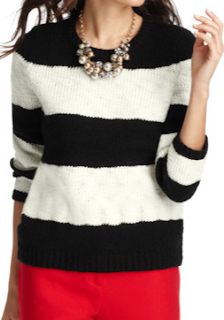 They make a person look a bit more classy :) This sweaters from Victorias Secret. I was working in the fitting room today and I noticed a lot of our customers have been trying on and buying this sweater. I understand why though. The sweater is super duper thick in person when you touch it and it is very warm. I love the back of the sweater and it is so soft. Ughhh... 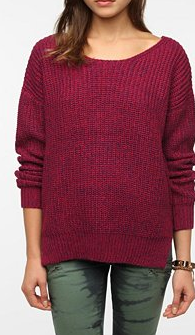 I need to buy this sweater tomorrow ASAP! By the way you can find this sweater at Urban Outfitters. This sweaters from the LOFT. I love the stripes!